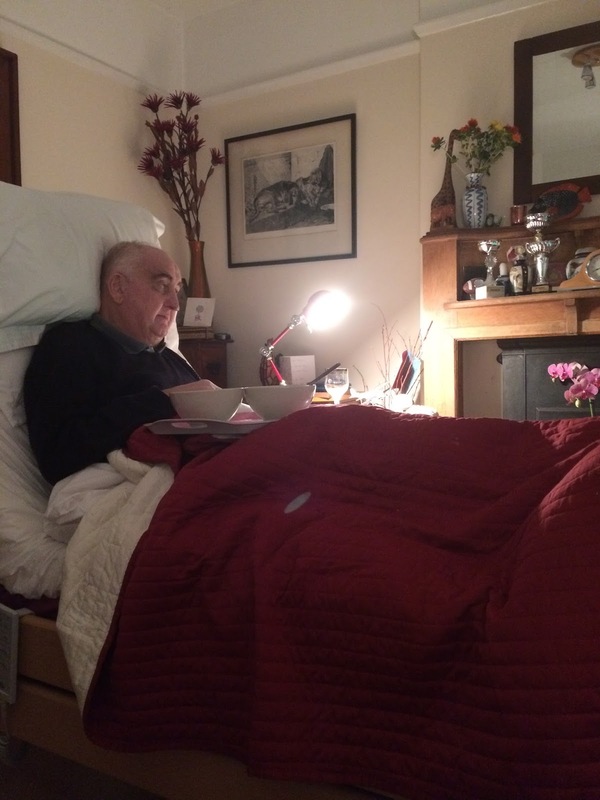 Alan, my husband, is ill. He has terminal bowel cancer. He takes his pills, is prescribed morphine for his pain, and we take a great deal of care to make him happy, to make him comfortable and to do what we can for the best. He is a strong character. He knows what he wants, and is extremely perceptive and intelligent. This all helps, and I am so grateful that he makes his decisions and articulates his needs so well. My job is to do what I can, and to be here with love. I can do that, and it isn't difficult. What is difficult is to remember to look after myself. say the nurses, the neighbours, my family and friends to me, and I say of course! I will! Thank you! But I have very little idea of what that means. What does it mean? Be kind to myself. Look after myself. Ok, I'll have an Indian takeaway and order some shoes from Amazon. I will give myself cakes, some more tea, I will have more bubbles in my bath. And yet, I don't really want more bubbles. I will have the cake, and the takeaway, because like a hamster I will always eat and if I could store it all in my cheeks too I would, but I don't really feel any better. The shoes arrive but they don't make Mr B, my husband, any better, and all the time, I feel a little bit sad and a little bit low. There are two of us in this dance, this dance towards the end of this life for Mr B. His cancer is defining his journey, and he is dealing with it day by day, moment by moment, all the time, and I am with him all the way. But I don't have cancer, and I am also an observer, I am in another space to him and I can only go so far. We hold hands, we talk, we know the score and we talk about our preparations for the future (both mine and his), but I can only watch as his illness takes its toll. There are two of us in this dance, and though we are holding each other, we have different steps. I am well. Thank you, I am well. I think I am looking after myself, I think I am being kind to myself, whatever that means. I wonder, does it mean that with proper self care, that I will be wiser, have more energy, be less sad, make better decisions? It may well do, it may well mean that I cope better with watching my Mr B being unwell. It has been on the one hand, a very busy time. Mr B has a routine that works for us and there is always much to do. Household things, practical things, caring things. I have my family and a tiny bit of my outside life I still deal with, taking time away from the house when it's possible. On the other hand, there is so much time. Sitting with Mr B when he is resting and sleeping is good for both of us, and when the jobs are done, we love to spend an evening together watching television and chatting. Nothing gets done, and time goes by, it is a different kind of busy completely. I am amazed at how calm I am as the days go by, and I am pleased by the lovely little things that Mr B and I order online for the household and for the sheer hell of it. But recently, he went back into hospital for a few nights in great pain, and I came home on my own. It was after a second night of hardly any sleep that I began to realise that this is a symptom of not knowing how to really look after myself. It wasn't just these two nights that I have not slept, it is every night that I don't sleep. I just noticed it when Mr B wasn't in his bed in the sitting room. I am tired when I go to bed but I don't want to sleep. My body resists it, my mind resists it, and I have been pretending to myself that this is not the case. And what is more, I want to eat all the time. I want to eat things I don't normally eat, like huge white bread sandwiches in the middle of the night, and chocolates. I am not hungry but I want food. I want comfort, I want to feel content, I want to save myself from feeling the sadness. And I can't sleep because I don't want to let go. I haven't spoken to anyone about this business of looking after myself, of being kind to myself. I thought I was looking after myself - in many good ways I am. I have a lovely memory foam mattress for my bed, I have baths in the afternoon when the sun is shining into the bathroom and the house is full of flowers. Mr B certainly seems as shiny and comfortable as he can be, and it is a well known fact that if he wasn't shiny and comfortable, he would let me know. But the deep, silent, inside places, the vulnerable places where I don't want to go, where I fear the difficult feelings, are not being addressed. And so, I am not sleeping well, I am wanting to eat sandwiches in the night, and all my body is aching. Being kind to myself, looking after myself, means paying particular and dedicated attention to these parts of me, and looking them directly in the eye, so to speak. Here is what I will do. Solutions. Plans. Acknowledge that I am not meant to be on top form all the time. And when I am asked how I am, which I am a lot, by caring, compassionate, kind family and friends, blinking well tell them if I am tired, or craving deep fried mars bars with custard. Tell myself it's safe, it's fine, to feel lost and low, tell myself that anyone who is walking the cancer journey with a loved one, will feel very sad at times. 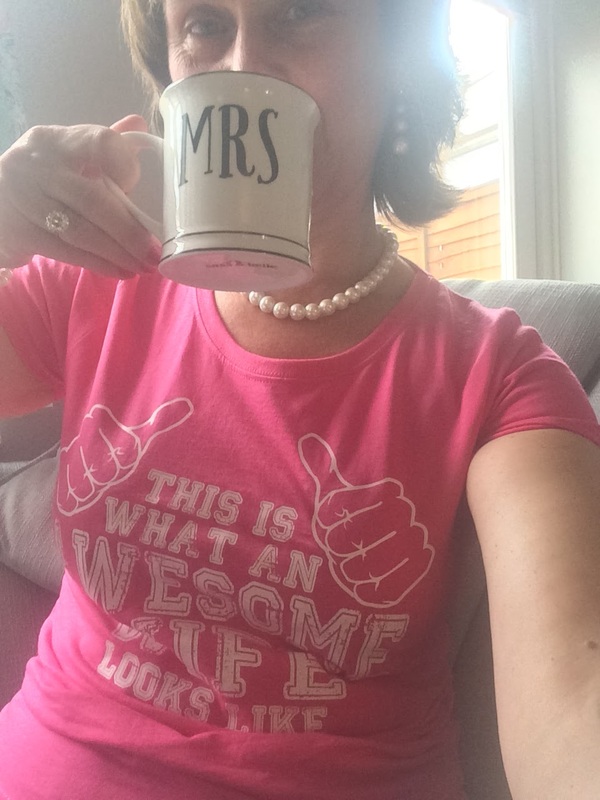 Wearing my awesome wife t shirt and drinking from my Mrs mug, spoilt rotten by Mr B. 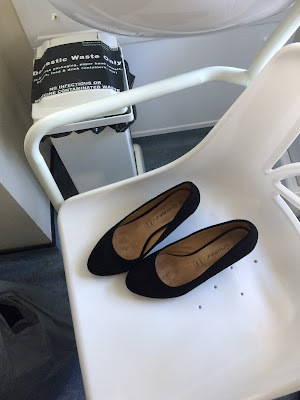 Having written this, it seems that looking after myself, being kind to myself, is not so much a physical act, but more of an exercise in self awareness and courage. My husband is suffering from a cancer that will not get better. He is often in pain and coping with a disease that will end his life. Of course I won't be sailing through this as if all it takes is a bit of planning and some late night snacks. Of course there will be consequences for me and for all his family and friends, and I bet I am not the only one craving white bread and butter sandwiches in the early hours because I can't sleep. It seems that this looking after myself, being kind to myself is an ongoing thing. It must be this way for all of us. and perhaps, in the long run, we all get by somehow. I will keep you updated. Mr B tonight with supper, newspaper and on the telly, football. Perfect.